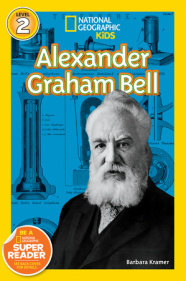 National Geographic has just released my latest biography for kids, Alexander Graham Bell. As always, I had a lot of fun doing the research. It would seem to be a reasonable assumption that writing a shorter book for younger readers would take less work, but that’s not the case. I do as much research for books for young readers as I do for biographies for young adults. That’s because finding the details that make the reading interesting for kids requires a lot of digging. Of course, I end up with way more information than I can use. So the cutting begins. To do that, I try to think like a kid. I’ve learned there are some things about a subject that interest me as an adult, but they don’t mean much to kids. So I work on deleting those sections and focusing on kid-friendly details. It’s sometimes hard to let go of information I’ve worked so hard to find, which explains my need to say a few more things about Bell in this post. Hopefully, some of these tidbits are new to you as they were for me. Bell hung a painting of an owl in his lab. The painting was a gift from his wife. It was her way of teasing him for his habit of working in his lab long into the night. Bell was a friend to Helen Keller. He was devoted to helping deaf people learn to communicate, and his reputation as a teacher spread. One day, Helen Keller’s parents brought their six-year-old daughter to see Bell. At that time Keller was an angry, unruly child. Kicking and screaming were her only ways to get what she wanted. Bell saw an intelligent child behind all that frustration and he believed that she could learn to communicate. He suggested her parents contact the Perkins School for the Blind in Boston. That’s where they found a young tutor named Annie Sullivan. The rest, as they say, is history. Bell and Keller kept in contact. They wrote letters and Keller was a guest in the Bell home many times. When Helen Keller wrote her autobiography, The Story of My Life, she dedicated it to Alexander Graham Bell. In 1898, Bell became president of the National Geographic Society. His father-in-law Gardiner Hubbard was one of the founders of the National Geographic Society in 1888. After Hubbard’s death the board elected Bell to be president. Bell helped to take the National Geographic Magazine in a new direction. In the early days, the magazine was mainly for subscribers who were primarily scientists. Bell believed that all people were interested in learning more about the world and he wanted the magazine to reach more people. It was his idea to add the photos, illustrations, and maps that the magazine is famous for today. Bell never stopped inventing. His profits from the telephone made it possible for him to work on projects that interested him. One of those was flight. He built huge kites of various types. His goal was to build one that could safely carry a man. Then he would add an engine. Bell and his four much younger partners achieved some aviation firsts including the first plane to fly more than a half mile in public and the first heavier-than-air flight in Canada. Another of Bell’s interests was hydrofoil boats, which skimmed across the water as if they were flying just above the surface. He called his boats hydrodomes and his first model was HD-1. But getting his boat to rise up on the water as he wanted was not easy. After nine years of experimenting with different models of his hydrodome, some said the HD stood for “Hope Deferred.” But Bell had a long history of persevering. “There are no unsuccessful experiments,” he said. “Every experiment contains a lesson.” In 1919, his HD-4 model reached a speed of a little over 70 miles an hour. It was a new world speed record, one that wasn’t broken for another ten years. Bell was 72 years old when his boat set that record. Some of this information made it into the book, but in a much condensed form. On the other hand, the book contains many other details not included here. Choosing kid-friendly details is not a science. It’s more about gut feeling. Hopefully, I’ve picked details that make the book interesting for kids, facts that will make them want to learn even more about Bell. I love this Barbara, thank you for sharing. So interesting! Thank you, Beverly. I just checked out your blog and I’m looking forward to reading more of it. Nice work! Really intriguing “tidbits,” Barb! I am always fascinated about how other authors research and write about their subjects, and you’ve illuminated your process in this interesting blog. Very interesting, Barb! I didn’t know these facts about Bell. I’m going to share on Facebook and Twitter.